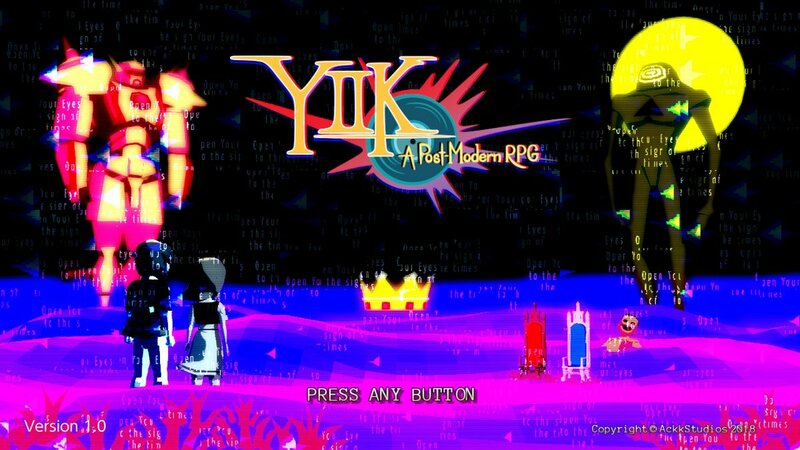 YIIK: A Postmodern RPG has finally released after an extended development period of nearly six years. This Western JRPG made waves ever since it was first announced, thanks to its eerie aesthetic and unique premise. Beneath all the artistry and surrealism, however, YIIK latches onto a strong set of personal beliefs, to varying degrees of effect. The game unabashedly wears its 1990s-inspired heart on its sleeve. I’ve talked at great length about the role nostalgia plays in modern game design. It serves as a crutch for developers stuck in the past and as inspiration for those looking towards the future. Ackk Studios, the developers of YIIK, has tried to use it as both. YIIK is undoubtedly a work of art. However, in trying to tell its story and make a point, it sacrificed much of its gameplay. 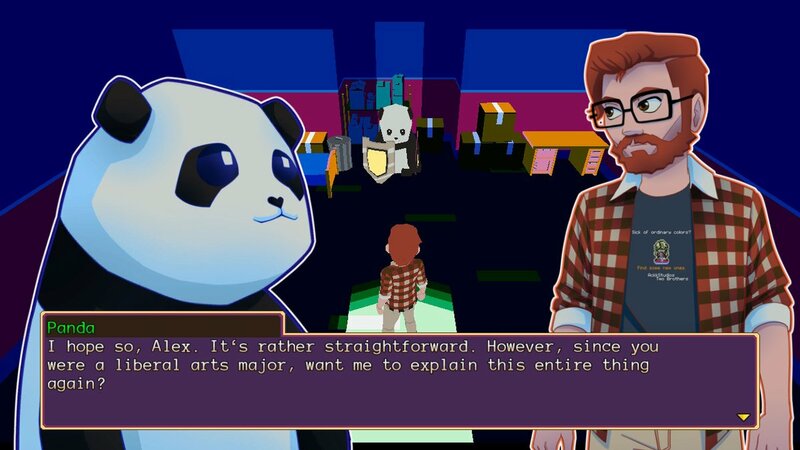 YIIK both embraces and rejects the role nostalgia has played in its design, to varying degrees of success. It’s a game that’s hard to recommend but will provide a uniquely personal experience for those that take the plunge. Set in the year 1999, the game follows Alex Eggleston, a college graduate who’s returned home and is eager to do nothing of consequence. Sporting flannel, a love for games, thick plastic glasses, and a vast vinyl collection, Alex wears the hipster label proudly. His immediate concerns consist of holding onto that shred of irresponsibility before adulthood can fully rear its ugly head. An aimless day of meandering leads Alex to a chance encounter in an abandoned factory with a young woman, Sammy Pak. Inexplicably drawn to this strange girl, their meeting gets cut short when extraterrestrial entities drag Samy into a cosmic void. Alex quickly enlists the help others, all of them bound together by a mutual search for the truth. What follows is a mystery that takes Alex and his friends to the bounds of time, space, and the end of the world. YIIK’s story cultivates an unsettling aura that allows for the surreal and metaphysical to exist logically within the game’s world. Ghosts and samurai rats exist alongside arcades and pizza, with nobody batting an eye. Cosmic entities from other dimensions, mind dungeons, and astral powers have their place in this world. These supernatural and mysterious elements play a wonderful role in ONISM1999, an in-game message board. ONISM acts as an online hub for individuals that want to delve deeper into the reality of the world. Users carry out “discussions” in various threads on local supernatural happenings. Not only does it help flesh out YIIK’s unsettling tone, it gives audiences a peek into the early internet age. That holds true for much of the game. In many ways, YIIK is a faithful parody of the era in which it takes place. It captures unique qualities of the late 90s, particularly where pop culture is concerned. A clear affinity for the 90s sometimes proves a little too much. The issue lies in the thoroughly unsubtle way the game winks to its audience at times. Meta jokes, self-reference, and direct communication to the player through in-game dialogue happens so often that it nearly becomes frustrating. Yet, for all of its philosophical posturing, meta-commentary, and surrealism, YIIK tells an incredibly personal story of doubt, determination, and belonging. It digs deep into raw emotions by contrasting its human emotions with its inhuman scenery. The specific life experience of an aimless liberal arts hipster like Alex doesn’t exactly address a wide audience. As the game progresses, however, his story transforms into something that is far more universal. YIIK ultimately presents itself as a coming-of-age story covering a unique period of life: early adulthood. The road to get there tries to break down the pretension into something raw and personal. Almost imperceptibly, the narrative shifts from an outward struggle to one that focuses inwards. As the story moves forward, it delves into the melancholia of adulthood and the unwanted burdens it brings. The game does a masterful job of relating its core themes across the main cast. Each of the characters come from different walks of life, but they all face the same existential dread that plagues Alex. Though circumstance brought them together, their friendship sees them through to the end of days. 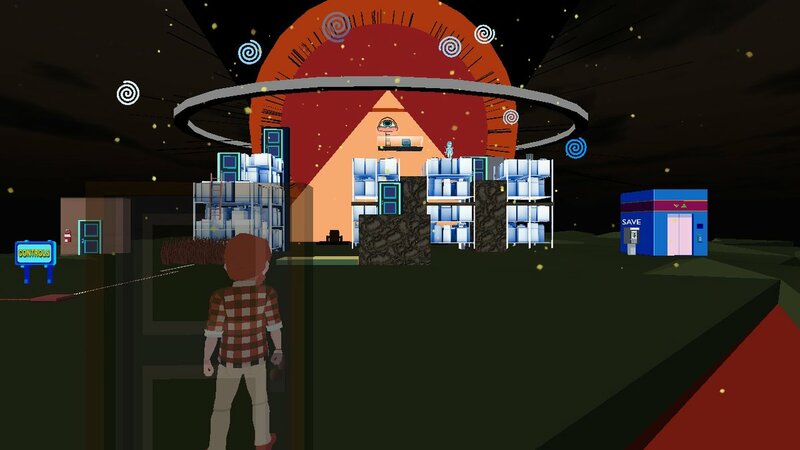 Sure to be the most striking aspect of YIIK is its unique offbeat presentation. Violently vibrant neon tones clash in harmony with an unsettling score amidst a low-poly world not unlike our own. The art style works in tandem with the narrative and music to produce an experience that unnerves the player to attention. Much like the story does, the visuals place a heavy emphasis on the mundane and surreal inhabiting the same space. 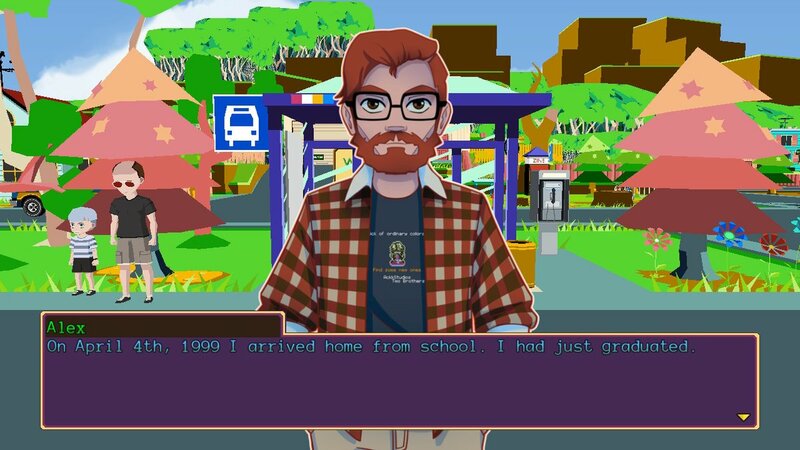 For example, YIIK’s setting is distinctly suburban America in the late 90s. All the hallmarks are there: bus stops, gas stations, strip malls and the like. However, spaced-out character designs, off-color scenery, and surreal geometry place this reality distinctly outside of our own. Over time the distinction between the mundane and surreal break down. Abstract concepts and ideas take shape, filtering into the world. In these moments of bizarreness, any sign of reality keep us grounded: a telephone, a stop sign, a stuffed panda. They help assure us that the world hasn’t ended yet. Completing the trifecta of presentation, YIIK’s music brings the same ethereal quality that its story and visuals do. The game’s original soundtrack boasts a trippy, chunky set of songs that have as much character and personality to them as everything else. Tinny synth beats blare alongside dreamy post-rock melodies and gentle, romantic lullabies. Mood and tone dictate the game’s presentation, and it’s all the better for it. So much of YIIK’s strength lies in its uncompromising artistic vision. This is, however, also one of its greatest shortcomings. While YIIK’s presentation deserves much praise, its gameplay unfortunately falls short in several places. 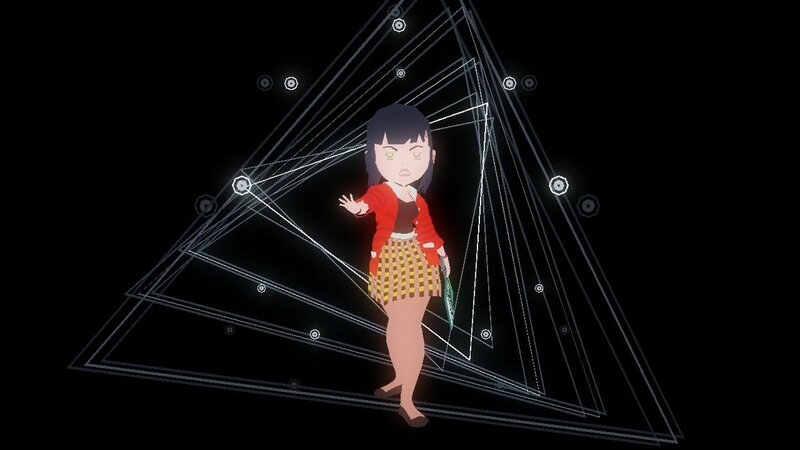 At times, YIIK feels like a philosophy class that put on an old, ill-fitting JRPG costume. It has a certain retro charm to it, but the awkwardness of its meta-commentary continually gets in the way. YIIK’s combat stands as the primary culprit behind the game’s clunky feel. The premise seems simple enough: standard turn-based JRPG combat with active minigame components. Much like Paper Mario had, these small bits of gameplay within battle provide a far more engaging experience than simply selecting menu options. Unfortunately, the combat has the minimum amount of logic and strategy to it. It has all the staples (HP, MP, status effects, turns, etc.) but fails to explore them in any deep or meaningful way. Reduce opponent HP to 0, keep your’s up, use MP to cast spells, and so on. Standard JRPG fare. The shallow nature of combat becomes evident when you realize that you lack any way to properly strategize. There are certain mechanics that are objectively better than others; not using them puts you at a disadvantage. Low damage basic attacks further compound the combat slog. It never becomes quite clear how to optimize your builds or strategies in order to fight more effectively. It wasn’t until late in the game that I fully capitalized on an exploitative tactic that allowed me to breeze through most fights. Beyond the actual gameplay aspect of combat, it just feels downright slow. Character animations can stretch on for seconds at a time. While this doesn’t immediately signify a problem, it becomes ore obvious as the number of battle participants grows. At that point, any method of cheese becomes acceptable. Fights would often take several minutes to complete, thanks in large part to the long animations and low damage numbers, neither of which I had much control over. Something that let me dictate the flow of combat would, naturally, be more desirable. Outside of combat, so many gameplay elements seem like bizarrely uninspired design choices. 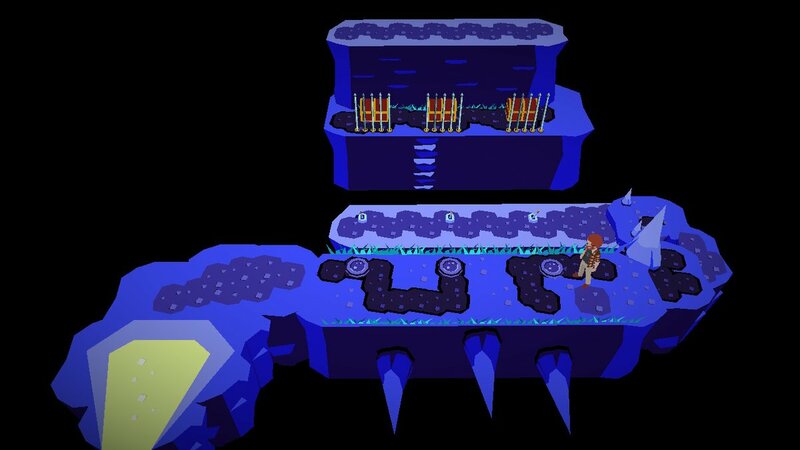 Chief of these are the game’s dungeons, which exist in a binary of being either ridiculously simple or annoyingly obtuse. Many dungeon puzzles amount to little more than interacting with objects to progress forward. Other times, these puzzles require lateral thinking in ways that are more frustrating than fun to solve. Curiously enough, these thoughts about the dungeons were part of other similar observations about the game’s design. So many things serve no discernible purpose. For example: an overabundance of save points, terrible inventory management, and excessive loot. Worst of all was the last stretch of the game, which ended with me pressing buttons to literally pass the time. 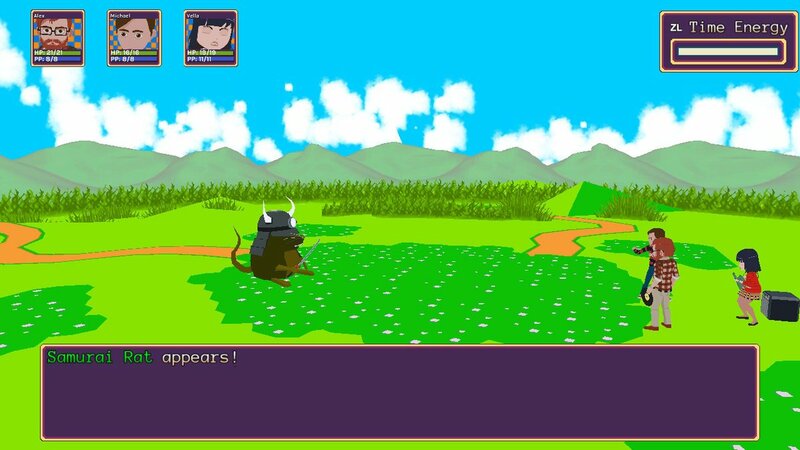 YIIK’s use of JRPG design functions more as a framework rather than a set of mechanics. Aside from the minigame combat, YIIK really doesn’t expand outside of traditional JRPG convention. The bizarre choices on specific aspects of the game’s design make this feel like a deliberate attempt to make me consider the game from a meta perspective. On the one hand, it plays perfectly into the notion of a “Post-Modern RPG”. It takes these well-established design conventions and calls their very nature into question. On the other hand, this makes for a gameplay experience that can feel muddy and obtuse. Perhaps that may be reading far too deeply into things. The curtains might just be blue and this game might just have some poorly designed features. Yet, for all the misgivings with these design choices not once did it ever seem like an oversight. For better or for worse, the game possesses a distinctly deliberate and personal feel. YIIK, for all its style and substance, has more than a few rough edges (game design choices notwithstanding). At several points in the game I nearly softlocked myself out of puzzles due to disappearing objects. Thanks to the (many) save points, that never happened. Beyond major issues such as that, YIIK felt just shy of well-polished. Too many small things added up to a somewhat bumpy playing experience. This includes things like typos, finicky interactables, and load screens that took just a bit too long. With all that said and done, where does a game like YIIK stand? It would admittedly be difficult to recommend this to anyone looking for a conventionally fun video game. So much of it feels awkward and clunky to play through. By no means does it make it a bad game. YIIK, for all of its shortcomings, strives towards a uniquely personal vision. For that, Ackk Studios deserves nothing but respect. Games like this that challenge preconceived notions of what constitutes design come along once in a blue moon. If you can appreciate what it set out out to do, YIIK will give you an experience like no other. Summary : YIIK, for all of its shortcomings, strives towards a uniquely personal vision.